2 LIONS WITH A OVAL IN THE CENTER WITH LETTERS (I THINK) V&B AND A CROWN ABOVE THE OVAL:- I am fansinated with english china and pottery. I love to find unique pieces such as creamers and gravy boats and more I have started to learn and collect some of the pieces. My fathers parents were from england and came over to united states, my dad was born here in the states. I started to collect pieces from england when i was living in australia. I would go to a antique dealer and help unload the truck of goods that came from england, was able to get great pieces and 1st choice before the pieces went out on the floor from furniture to pottery to china. My life stlye has changed since then but i still have a few beautiful pieces , one being a large blue pitcher and bowl , a jug that is musical and some some sugar and creamers. 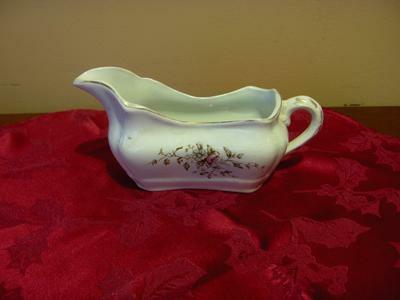 Now that i go to auctions to buy and sell i have come across this gravy boat. This piece i found here in north carolina at the bottom of a box at a auction. I have never seen that marking and i am curious to who made this piece and when was it made. The piece has crazing all over it but no chips or cracks. I hope you can help me adenify this piece . Linda, I have not been able to find this exact mark and it was difficult to find one with two lions instead of the usual lion and unicorn. However, I think I may have solved the mystery. According to Kovel's (1986) there was as company in Ohio that used a shield with two lions, a crown on top and the initials V B in the center that manufactured ironstone. The name of this company was Vodrey & Brothers Pottery Co. in East Liverpool OH. According to the Kovels this company was in operation from 1857 until 1928. You are a star again, many thanks for your many 'assists' on this site. Really appreciated. 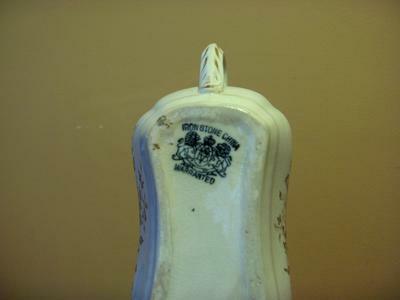 Following the clues unearthed by you hard sleuthing, I looked up my book of American marks and I did find this exact VB Ironstone Warranted mark listed under Vodrey Bros of East Liverpool Ohio. According to my book (1000 Marks on American Pottery), the mark was used from 1857 - 1885.